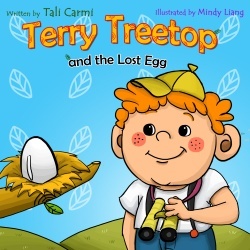 Terry Treetop and the Lost Egg by Tali Carmi is a super sweet, easy to read book for kids that teaches habitats and environments for animals in a way that kids understand. It starts with Terry Treetop observing nature through his binoculars and him finding a fallen egg. He goes from mommy animal to mommy animal to their different environments and asks them if the baby egg is theirs. He meets alligators, turtles, frogs, and a hen who all tell them they are not the eggs mother. He finally spots a nest high in a tree and climbs up to carefully place the egg in it’s place. He waits and waits until the eggs mother returns. Before she makes it, though, the egg hatches and Terry Treetop has to quickly let the baby bird know he is NOT it’s mother. Soon his mother returns and finds her baby alive and well and they live happily ever after! From the very start this book has an “Are You My Mother? ” feel to it. It is a great book for toddlers and younger children just learning to read. I can read it to my three year old who loves it or let my five year old who is just learning to read sit down and sound out words and read this book “by herself”. We have read it a few times, and it is a wonderful book to discuss different animal homes and why they are different. (animal needs etc) My kids love reading this book and the pictures in it are beautifully drawn and very colorful making it even easier for the kids to read this great little e-book. Right now you can find this book for free, but it may not last long, so be sure to check it out and purchase it now before the price goes up! You can read a quick description of the book and find where to purchase below!